Close to 400 Drupal enthusiasts and invitees attend an open-source software jamboree from 1-3 March, “surpassing all expectations”. Almost 400 Drupal open-source software enthusiasts, established businesses, start-ups and City computer science students attended DrupalCamp London 2013 from 1-3 March at City University London. The event featured over 40 presentations on a wide range of Drupal topics. Created in Belgium as a Drupal software message board by Dries Buytaert in 1999, Drupal has evolved into a free, open-source content management system (CMS) for online content and user communities. 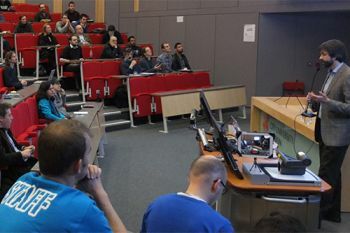 "The success of DrupalCamp London 2013 amply demonstrates City's commitment to and increasing recognition within the burgeoning UK technology sector. More importantly, our pro-active Professional Liaison Unit gave students in the School of Informatics an introduction to a cluster of established companies and start-ups in the important tech space." "City truly understands how to work with SMEs and technology companies. Greater collaboration between institutions such as City is part of the current agenda in the Silicon Roundabout and Tech city area and also for UK PLC. I would be really keen to work more with City in future to support academic and technical partnerships - a key ingredient for innovation, growth and regeneration. BrightLemon has organised a number of tech based events with City and Cass Business school in recent years and that's why we recommended them to the DrupalCamp London 2013 organising team. The event itself surpassed all expectations - the venue is perfect for tech community events and easily handled the 300-plus attendees. The catering was top-notch and the layout of both buildings perfect for all three days." Other DrupalCamp London 2013 organisers included Alex Burrows, Tim Deeson, Hedley Smith, Della Deme, Ben Wilding, Farez Rahman, George Hazlewood and John Kennedy.